I cannot take credit for the title of this post even though I SO wish I could because it is just so damn clever... and fitting. However, I decided to poach it from here for my own post, anyway (I know, I know, shame on me)! Ever since I read about said "Fauxmica" I've been obsessed, awestruck really, and have been dying to tell you all about it! I hope you all are as excited about it as I am... Because what it really means is something fundamental. We now have the tools to help the world become just a little bit prettier on the inside. I think I am so impressed by this stuff for two reasons: 1. The price (if I haven't mentioned it on here before, I am a Thrifty Ms.) and 2. the dramatic reversal of my snobbiness. So let's get on to talking about it already, shall we? I'm talking about Formica folks. If you don't know what that is, I suggest you look up a picture online and suddenly memories from your childhood up until your present will come flooding back to you. It is an unmistakeable countertop laminate material that makes no bones about being expensive... That is until NOW! You see, I have a heavy disdain for Formica, it's right up there with linoleum (shudder). Both materials have the ability to make me cringe first and then make me dreadfully sad because they ruin any room where they are placed. They can take anything that ever had any potential of being beautiful and turn it into a space that has proverbially "let itself go." BUT, it now appears that they must have tired of being the red-headed step child of countertops because they have now gotten their act together and have come out with this magical stuff called Formica 180fx. 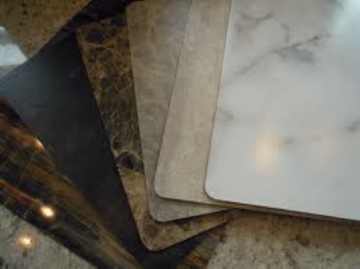 Practically imperceptible, the Formica people have created laminates that mimic fancy countertop materials (read: Calacutta/Carrera marble, limestone, petrified wood, black fossilstone, slate sequoia, and many more, which you can see here). Yes, it's true! Champagne dreams on a beer budget? NO PROBLEM! I found this short little vid explaining it, to be quite interesting... Perhaps you will too! The "Fauxmica" runs about $16 a square foot compared to the materials it impersonates which can range from $60-$200 a square foot. It is essentially the cubic zirconia of the granite/marble industry... Which means, if you're not in a place to blow your budget or stretch it on only one element of upgrading your kitchen/home, then Formica 180fx is the perfect answer to your woes. Still don't believe me that you can't tell the difference?? So, what do you say now that you've had a better chance to "formiculate" your opinions??? :) Am I right or am I right that this stuff is miraculous? !